Before talking about herbs or no herbs, I would like to compliment SousVide Supreme for their excellent customer service. 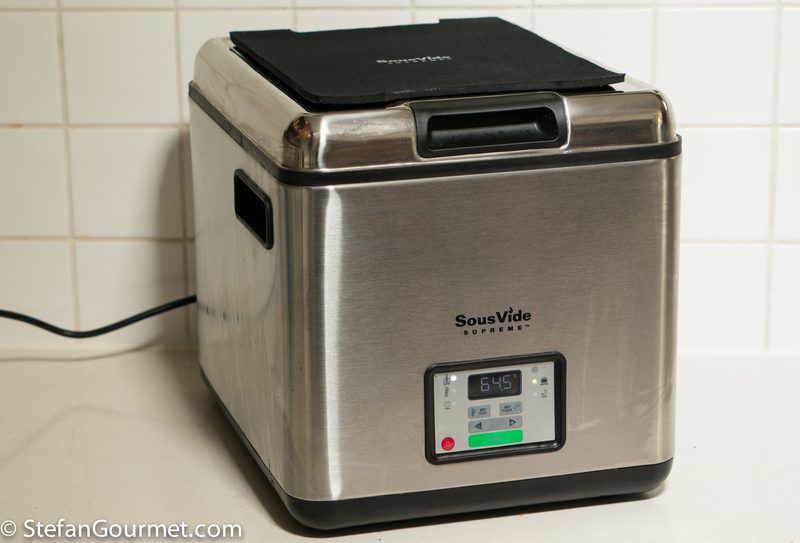 After six years of faithful service, my SousVide Supreme water oven had burnt out. I e-mailed customer support about this, and they offered to replace my faulty unit with a refurbished one. I only had to pay for shipping my unit to them (which cost me 10 euros), and upon receipt of my faulty unit they immediately dispatched the refurbished unit. After six years, a lot longer than the 1-year warranty, that is very good service indeed! There is a Facebook group on sous-vide cooking called Exploring Sous Vide that is well worth joining if you cook sous-vide, because it has an active community to ask questions or share your successes (and failures). I am one of the more active of the more than 5,000 members. 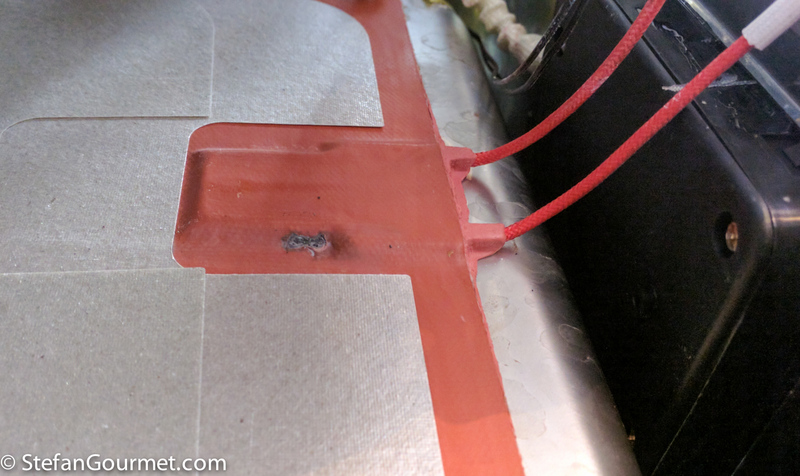 Some members make the craziest assertions that I know for a fact are untrue after more than six years of intensive experimenting with sous-vide cooking, but sometimes I am not completely sure either and it prompts me to do another side-by-side experiment. 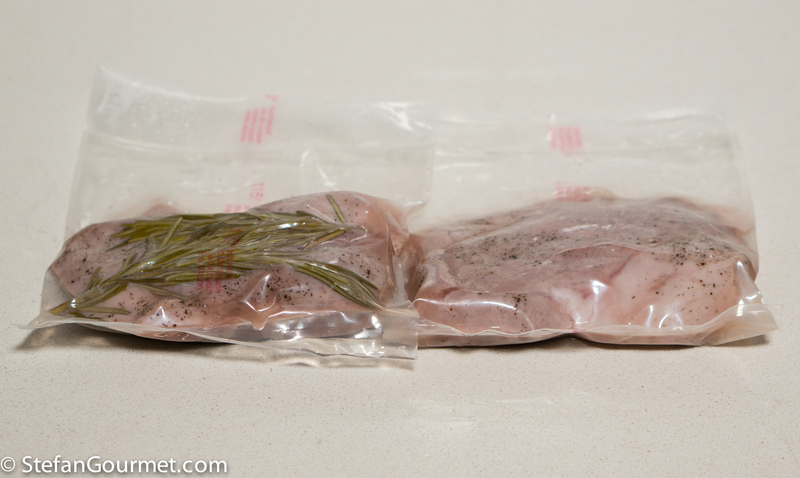 One of these questions is whether or not it makes sense to include herbs in the bag when you cook meat sous-vide. There was some debate about this and one member stated that because there are juices in the bag at the end of the cooking, that means that flavor only goes out of the meat and does not go in. That didn’t make any sense to me, but to make sure I decided to do a side-by-side experiment. I started with a nice piece of leg of lamb, that I cut into two pieces. Then I seasoned both pieces with salt and freshly ground black pepper, and vacuum sealed one of them with a generous amount of fresh rosemary. The other piece was vacuum sealed without rosemary. After those 2.5 hours the lamb looked a bit grey, as is usual with sous-vide cooking. The result: both pieces of lamb were delicious, tender and juicy. 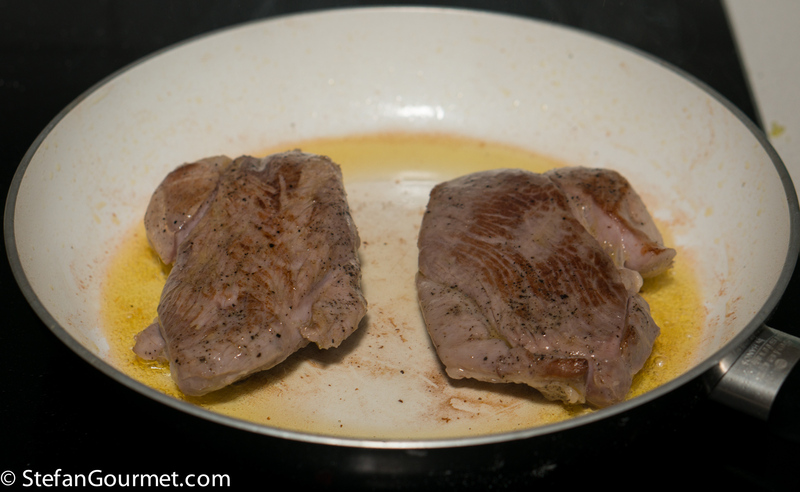 A clear hint, but not more than a hint, of rosemary was detectable in the piece that had been cooked with rosemary. The hint was clear enough that I could distinguish between the two in a blind experiment conducted with the assistance of Kees. So the result of the experiment is: yes, it does make sense to include herbs in the bag, but don’t expect a strong flavor if the cooking time is short. A couple of remarks: for a more pronounced rosemary flavor, it may help to put some olive oil in the bag (as the essential oil of rosemary dissolves more easily into oil than into water). The rosemary flavor will be stronger if the meat is cooked with the rosemary for a longer time, or if it is allowed to marinate before or after cooking. I have read the ChefSteps recipe. The problem with lamb is that it is not very well defined what is lamb and what is mutton. There is a big difference between a young lamb (abbaccchio) of 3 months or near-mutton of 12 months. When cooking a whole leg of lamb you should also consider the thickness for the core to reach the cooking temperature. Apart from the thickness, 6 hours should be plenty for lamb if it is not mutton. As for garlic, there are two reasons why some people advice against it. One is that not everyone appreciates raw garlic in sous-vide cooking. When combined with herbs like rosemary or sage, I have used garlic without problems. The second reason is fear of botulism. Garlic can be infected with botulism and it likes an oxygen-free environment to grow. Dried granulated garlic could be used as a substitute, but it is not as complex in flavor. Interesting! I’ll have to check out that group. And very good to know about the company. Great info as usual Stefan! I too will check out the group. Thanks! I normally season including herbs or rubs before bagging. Have done an outstanding prime rib roast medium rare. Perfect flavor. 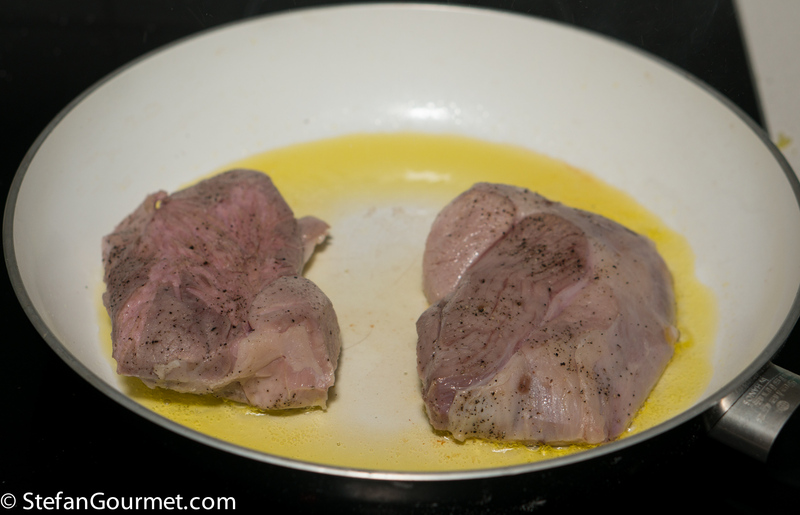 Browned under a broiler before serving. I have also brined or rubbed with salt conventionally then rinsed, seasoned, and bagged before cooking. It works very well too. Glad to know they stand behind their product. I have recommended it to friends who want a simple setup. They are always pleased. Good to read a confirmation of the process. Great tips and it really looks juicy and delicious! A couple of questions about cooking sous vide. If for example I was making your lamb here using an Anova with the app on my phone, and then I left to go to work and wouldn’t be back for a few hours to take the bag out of the water, what temperature can I leave the meat in the water at so that it doesn’t continue cooking? Or would turning the Anova off completely (which would slowly bring the water back to room temperature) for a few hours work? 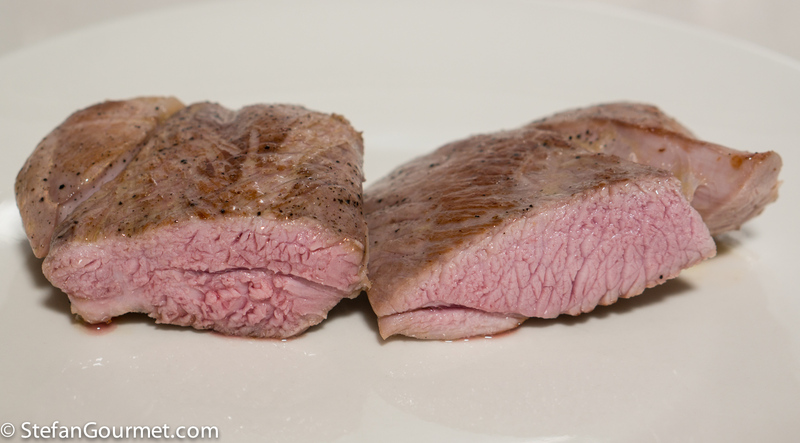 Separately to this, Is it possible to refrigerate or freeze the meat after cooking sous vide so that you can brown it when you want it to eat it at a later date? If this is possible, do you need to bring it to room temperature first before browning? If you did this would the middle of the meat be hot enough? Hi Marco, if you lower the temperature to 53C/127F you can certainly leave it for a few hours. It is safe to keep at that temp because no pathogens can grow, and the meat will coook very very slowly. I have never tried this, but I think you could easily keep it for 6 hours. As for your second question, yes it is possible to refrigerate or freeze after cooking. 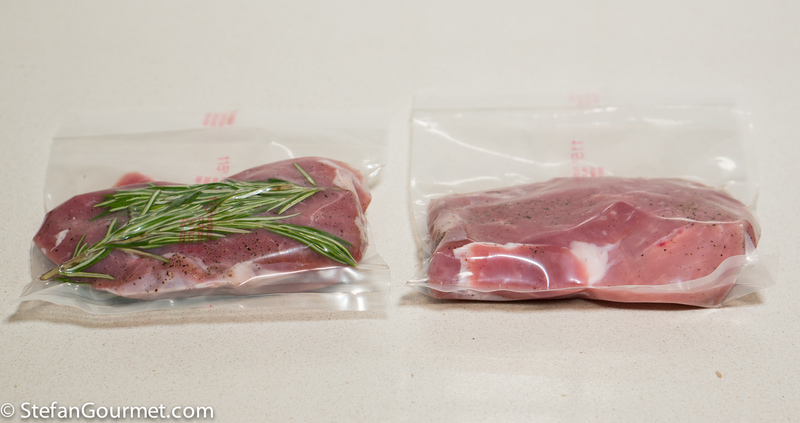 Cool the meat in the bag in cold water (or even better, water with ice) before refrigerating. Before browning, reheat in the sous-vide to a temperature a couple of degrees lower than the original cooking temperature. Half an hour will usually do the trick, except when it’s very thick. If you brown straight from the refrigerator, the center of the meat would indeed not get hot enough. 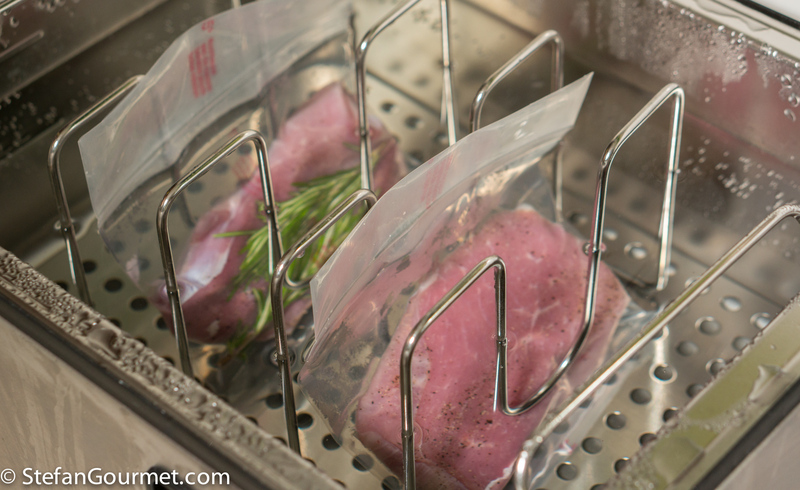 If you freeze it, you could defrost and reheat it by putting the frozen meat in the sous-vide for a couple of hours.